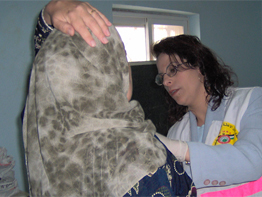 The Women’s Health Program (WHP), built on grassroots initiatives and established by the UPMRC in 1987, has since grown to reach Palestinian communities throughout the West Bank and Gaza Strip. It functions in 25 localities, covering a population area of 365,872. Since its inception, its mandate has expanded from providing antenatal gynecological exams and family planning services to the provision of comprehensive packages of services addressing both the physical well being of women as well as their mental, social and environmental needs. The Women’s Health Program’s primary goal is to provide quality women’s health care services in the OPT and thereby improve the quality of life of Palestinian women. The main strategies of the program cover the areas of direct service provision, preventative work through raising public awareness, training of health professionals, advocacy, and coordination with other providers and the development of women’s health protocols for national use. Specific strategies include various Service Provision Strategies (exp. clinical health services and community activities), Preventative Strategies (exp. implementing awareness raising activities for women of all age groups, utilizing Information, education, and communication (IEC) materials, and utilizing visual and audiovisual media to promote women’s health care), Training, and Advocacy and Coordination. The events of 2002 presented considerable challenges to the Women’s Health Program because of the lack of freedom of movement due to closure, as well as the effects of curfew and invasions. PMRS was able to react to the emergency situation and maintain a considerable rate of success. The following are some of the obstacles that negatively impacted the entire health standard in Palestine. • The partition and isolation of Palestinian villages led to women being prevented from accessing health care services. • Health providers were not able to reach their workplaces in the villages and sometimes even inside the cities. • There were frequent delays in the delivery of medications and vaccination to the health care centers. • There were frequent delays or prohibitions of movement of ambulances to reach patients including women in labor in villages or communities under curfews. • Destruction of infrastructure made it impossible for private and public vehicles to go from one area to another. • The lack of skilled and trained health providers residing in villages and isolated areas complicated the situation further. • Increased unemployment and poverty levels among Palestinians especially communities of rural areas prevented people from accessing health care services. • Decentralization of activities and services from cities. • Decentralization of training activities. • Deploying women’s health mobile clinics. • Conducting training in obstetric emergency and establishing liaisons with local midwives and traditional birth attendants. • Increasing the supply of medications in clinics. • Establishing emergency networks with providers through the Internet. • Preparing a package of information regarding standard procedure of home deliveries. • Broadcasting program on home deliveries. • Attending home deliveries in villages in cooperation with other NGOs. - The program started only in one clinic then expanded to reach 25 localities. - Started with provision of limited clinical services (antenatal, gynecological exams and family planning) then expanded to provide a comprehensive package of services, including psychosocial services. 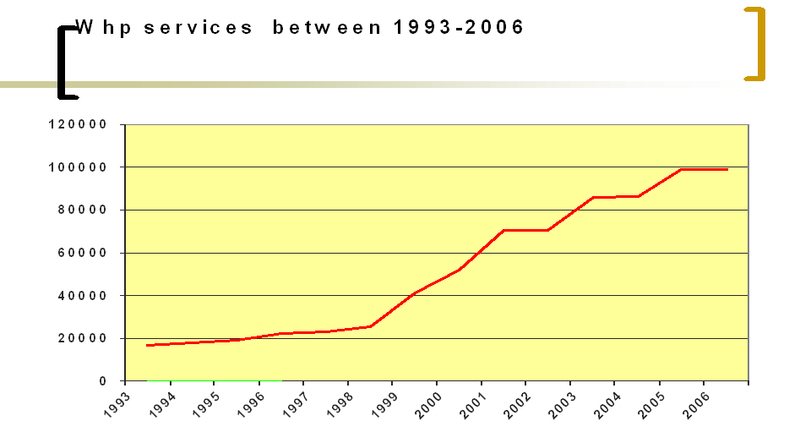 - Increasing number of beneficiaries (the number was 8500 during 1988 and reached 98,000 in 2005). The Main Goal of the program: To provide quality comprehensive reproductive health services to achieve quality life for all women in the Palestinian territories. 2. .To raise women’s awareness towards their own health needs. 4. To raise public awareness towards issues affecting and influencing the health status of woman including social economical, legal and political. 5. To mobilize the community to cope with the emergency situation. 7. .To improve the skills and capacity of the health providers in the program, and in the MOH and other NGOs working in the area if R/H. 8. To contribute to the reduction of maternal mortality and morbidity , which had increased as a result of the Israeli military siege and closure. 1. Clinical services at the clinics, out reach clinical services for isolated and remote areas by mobile women's health clinic. 2. Awareness raising activities for women of all age groups. 3. Community activities (e.g., home visiting and other community-based services). 4. Use of IEC materials. 5. Use of the media. 6. Capacity building activities through in-service training courses for the staff. 7. Lobbying and advocacy for women’s rights. 8. Cooperation and coordination with all providers of women's health services. Comprehensive clinical services are provided in our 25 health centers in the West Bank and Gaza and in 30 other villages by the mobile women health team for women of all age groups. • At the first booking, all women receive comprehensive general examination, counseling and plan for follow up. • All women who need special care receive home visits. • Health education sessions are given at each follow up visit. • All women who identified to be at high risk and need special care or develop complications are referred to hospitals. • All beneficiaries are screened for anemia, urinary tract infections, diabetes, hepatitis B, and fetal malformation. • Ultrasound is performed 3 times during pregnancy for all pregnant women according to the protocol. Gynecology: diagnoses and treatment of reproductive tract infections and diseases is one of the most important aspects of services provided in our clinics. Main reasons for visiting the gynecology clinic are: reproductive tract infection, menstrual disturbances, urinary tract infections, R/T tumors. Postnatal care: postnatal care services are usually provided during a home visit within the first week of delivery. Full examinations for postnatal mothers performed for women attending for the vaccination for their children or when attend for family planning at the 6th week after delivery. Family planning: our program is considered one of the important sources for family planning services in the Palestinian territories. All women attending for family panning services receive counseling. The Health education program for women during antenatal visits and during the postnatal period is believed to have a role in the increased attendance at the family planning clinic. As a rule, all women during antenatal and postnatal periods receive health education sessions on the importance of family planning and advice on contraceptives available in our clinics. Home visits: Home visits are considered the main component of community health, implemented by community health workers and midwives. Home visits for postnatal mothers are considered one of the most important objectives of the program. • General check up, check for wound, bleeding, temperature, blood pressure. • Observation of the breastfeeding process. • Looking for any dangerous sign in the mother or the child. • Provision of health education about hygiene, nutrition, breastfeeding, dangerous signs, and family planning. • Provision of counseling for mothers with psychosocial problems. • Referral of the mother or the child when needed. Maythaloon Maternity home was established to meet the emergency need for delivery services that are close to the community to ensure accessibility of such services in the situation of closure and siege. Although the main objective of the maternity home is to ensure quality normal delivery service for mothers who are considered at low risk. The maternity home can also indirectly add quality to the hospital delivery by reducing the load at the government hospital and giving more space for taking proper care for high risk pregnancies. The main two screening tests conducted since the establishment of the program in 1987 are: clinical breast examination and Pap smear test. Knowledge is the most powerful tool for the improvement of the health of women and their families. To equip women with this tool, it is important to use an effective strategies to convoy the information and the educational massages. The first strategy: is reaching women at the clinics when attending for antenatal care or for family planning or any other service. The second strategy: is to reach women in neighborhoods. Awareness raising sessions and workshops organize for groups of women who are invited by the C.H.W or by women volunteers from the villages. The third strategy is; reaching adolescents at schools. Every year we target the students of the 9th, 10th and 11th grades, males and females in 40 government schools and in many other private schools. The fourth strategy is; reaching youth in the community, using peer educators who had been trained in the year 2004 on how to conduct health education and behavioral change meetings with their peers at university, summer camps, youth clubs. The main topic of discussion in those meetings was how to protect themselves from contracting HIV infection and how to face peer pressure and say No. The fifth strategy is reaching the public in large by using media .For this purpose video spots and short films were developed and transmitted in the local T.V station. The training unit in the program in coordination with the school of community health at PMRS organizes training courses and workshops for different staff groups. The program focuses on health personnel as a main resource for health development, The training aims at improving the skills and capacity of the health providers in the program, the MOH and other NGOs working in the area in R/H. In-service training courses are provided for the V HW; Drs and midwives at the School of Community Health. The program take advantage of training courses offered by the MOH and other national and international NGOs. The WHP staff receive upgrading and in-service training every year, according to the need each staff member should receive 35 training hours per year at least. • A training manual on emergency reproductive health, targeting community support teams. • A booklet "Your life during reproductive age". • A training manual for peer educators "Youth to Youth. • Communication skills for health providers. • Training Packages on breast cancer and breast examination, cervical cancer and pap smear test, antenatal care, postnatal care, ………and other reproductive health topics.